Svenssen’s book I suspect was mostly about athletic performance. 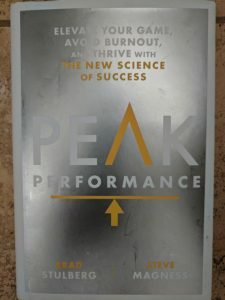 While Brad & Steve wrote a book that could be applied strictly to athletic performance, if that is the only reason you want to read Peak Performance you are doing yourself a disservice. When I first started reading this book it was strictly from the angle of how can I coach my athletes better. What weakness(es) can I expose about myself to myself to help me coach my athletes better so they can race faster? While reading in that vein this book was a struggle for me to get through. It neither captured nor held my attention. I set the book down for the better part of two weeks and pondered what my struggles were with this book. When I went back to re-read the book, ironically using some of the same things the authors talk about in the book, it hit me that my framing of the initial reading was wrong. My thinking needed to be centered around how I work, how the day to day tasks within the job flow and what that yields for my investment(s). It became more about what thing(s) inhibit me and what can be done to help me work better or smarter or better and smarter. Once I reframed my thought process there was no point where reading became about achieving peak performance on the playing field. The focus became how does one achieve day in day out better performance, not even peak performance, just better performance in life? Start hitting doubles instead of singles to use a baseball analogy. This book exposes the numerous little things we all do in the name of better performance that really detract from our ability to perform optimally, to focus fully, to get in the zone. It’s a book as much about, and, I think more about achieving peak performance in our day to day lives then achieving peak performance when you pin on a race number. Ultimately, this is where the strength of Peak Performance lies, at least to me. 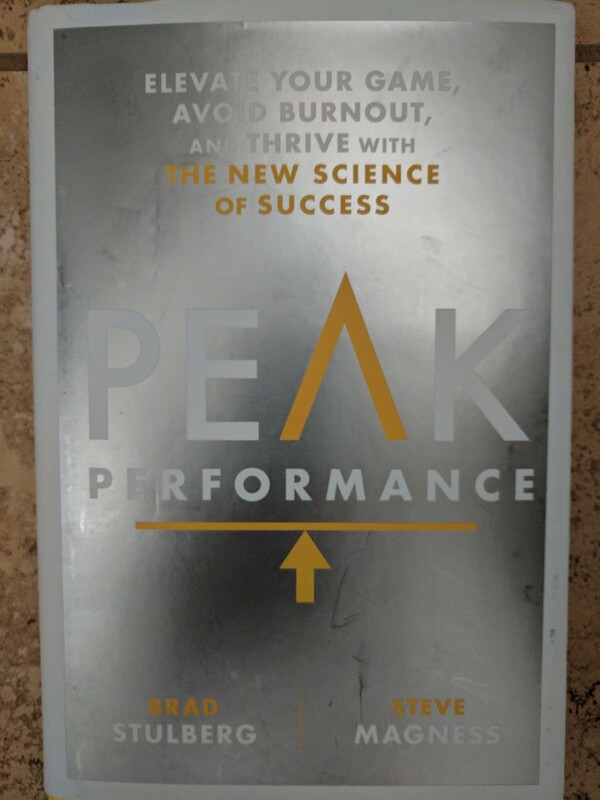 The first 20 or so pages of Peak Performance are not for the faint of heart. It’s everything dark we know about life and sports yet push to the periphery of our mind. Intuitively we know how complicated the world can be, how competitive it is, how one must constantly be “on” while performing, how the world is constantly moving forward, getting better with no regard for you if you fall behind, how we multi task trying to get twice as much done in half the time even though most often we end up doing half as much in twice the time. Brad and Steve attempt to help us help ourselves take back some control from today’s chaotic world. There is nothing radical in this book, no magic bullet that will enable anyone to rise to the top of their field. What this book does, and does well, is remind us of the tools we mostly know on some level and introduce us to tools we may not know about which can provide guidance to more optimally performing. The most potent parts of this book may be the inserted reminders and tips, the Performance Practices boxes and the last two chapters. If you just read just these you will walk away with 80% of the useable information contained in Peak Performance. Unfortunately, this book didn’t point out the exact things I need to modify in how I do my job. Brad and Steve’s book did help me to identify things I currently do that that inhibit optimal work flow and therefore optimal work performance which detracts from other areas in my life. In the week or so that has passed since reading Peak Performance, I have been able to leverage different parts of the book to reduce the amount of time spent doing tasks that do not contribute to my work production. It has spurred me on to make needed changes in my work area, remove some distractions from my work day and encouraged me to do a few things that ultimately help me help myself become better at getting things done. While I’m not as consistent with these practices as I’d like, over time the trend should be towards better efficacy both in work and life. Don’t read Steve and Brad’s Peak Performance to move up a few spots on the results sheet, although it may help you do that, do read this book to help you help yourself to identify and/or modify things that you can do to help you win more often at life. Winning there first will help you when you pin a number on.